When the monks cannot return to the Oratory for the Divine Office, they make an Oratory out of the place where they happen to be, not by building a structure of wood or of stone — although this was sometimes done — but by reproducing the silence, reverence, and fear of God that fill the Oratory of the monastery. What does Saint Benedict say concerning the Oratory? The second qualification, flectentes genua, indicates that, for Saint Benedict, the Divine Office is not merely a form of words. The Divine Office also engages the body in a very physical way: kneeling, bowing, standing, turning, falling prostrate, and sitting. Such gestures are not mere decorative bits of ceremonial; they are as constitutive of the Divine Office as are the words of the psalms, the antiphons, responsories, hymns, and other verbal elements. Monks sent out on a journey are not thereby dispensed from their servitutis pensum, the fulfilment of their bounden service. Saint Benedict says that they are not to allow the appointed Hours to pass by. It is the Divine Office that gives rhythm, discipline, and order to the life of a monk. The monk who neglects the Hours will soon begin to experience the disintegration of his life. Work will become invasive, like a devastating weed cropping up everywhere through the cracks. Weariness and acedia will set in. The monk who neglects the Hours becomes like a man without a compass and without a timepiece, going from one thing to another without the one thing that gives structure and meaning to the passage of time. It may not always be possible for a monk on a journey to read the Hours from a breviary. 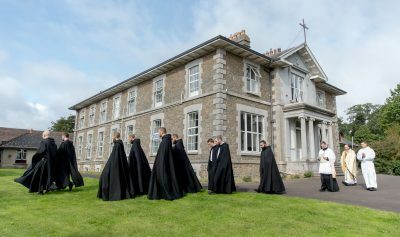 For the first time in about a century, we find ourselves in a situation not unlike monks after the French Revolution: monastic breviaries are increasingly rare and expensive. We have not even enough breviaries for each one in the community to have one. Fifty years ago, there would have been an abundant supply of monastic breviaries. Such is no longer the case. This being said, if a brother, for a reason that the abbot judges worthy, cannot read his Hours, he must, at least, say all those parts of the Office that he can recite from memory, making up for the rest from a Psalter at hand or with Our Lady’s Psalter, that is, the Holy Rosary, or with another form of prayer approved by the abbot. The great principle of this chapter of the Holy Rule is that the Hours of the Opus Dei are, first of all, the bounden duty that we are vowed to render to God in all times and places. Secondly, the Hours are constitutive of the monastic life. You may as well remove the vertebrae from a man’s body as the Hours from the life of a monk. Just as the body collapses into a formless heap without the vertebrae, so too will the life of a monk collapse without the supporting structure of the Hours.